Looks like heavy rock but it's made of high density lightweight foam. Use this prop for leaning on or sitting on. Use multiples to make larger walls. 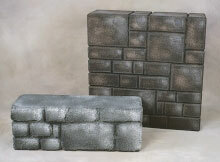 The large wall, pictured in brownstone, measures 34 inches wide x 34 inches high x 12 inches deep.